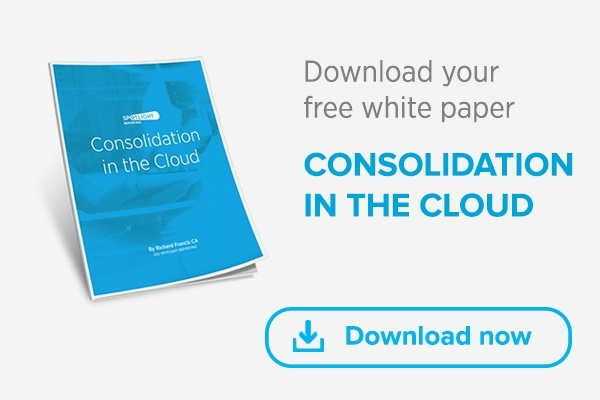 Being able to prepare consolidated reports is a ‘must’ for advisory accountants. Over time, your client’s entity may have grown into a multi-entity global business. Perhaps these entities were originally set-up to minimise risk and reduce tax or they simply diversified into other interests. Whatever the reasons, you now need to be able to prepare consolidated reports based on their group performance and position. Since May 2012, Spotlight Reporting has helped advisors prepare consolidated reports. Our first release enabled users to consolidate up to five entities and handle multiple currencies. Since then, the entity limit has increased to fifty entities and more currencies were added as our customers needs grew. Now, we are proud to announce our biggest update to consolidations since it’s inception. We’ve been listening to your feedback and it’s formed an integral part of this release. So what’s new in Spotlight Reporting? You can now tag accounts as intercompany accounts and Spotlight will automatically eliminate these every month. Just click the Eliminate Accounts button on the Group Customise Data tab and specify the intercompany account(s) in each entity. If there are any FX differences that arise from the elimination, these will be journaled into a FX adjustment row in the reports. 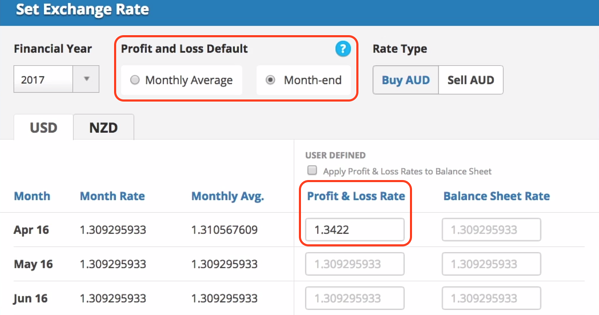 Of course you still want visibility over what is eliminated, so we have updated the Entity breakdown settings on the profit & loss and balance sheet pages. 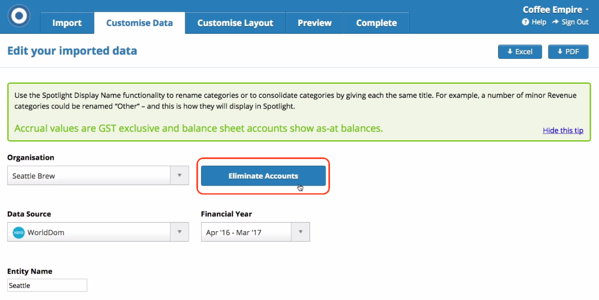 You can choose between the Detailed view which shows the elimination workings (debits, credits, totals before and after elimination) or the Summarised option which shows a summarised consolidation. 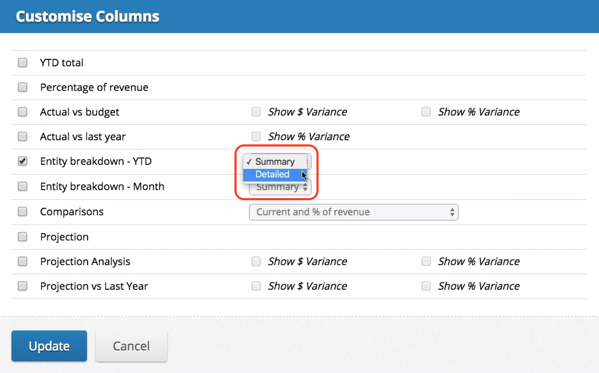 You may like to use the Detailed option to check you have eliminated the relevant accounts and then switch to the Summarised option when sharing the reports. Or you can enter your own rate. Balance sheet values can be coverted using the Xe.com month-end rate or your own rate. Check out our 1-min release video to see the new features in action. To get the most out of our product updates, view our post-release training webinar. We hope you enjoy the latest release.